Be a GEM and add extra sparkle to 2018! Come and join a team of Golden Event Makers (GEMs)! As we prepare to celebrate Telford’s 50 birthday in 2018, the role of volunteers has never been more important. If you feel proud about your borough and its communities, want to have fun and help make a spectacular 50th anniversary programme happen with like-minded people – come and join our team of GEMs! 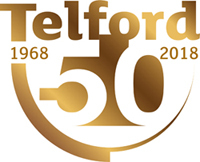 As a true GEM, you will play a special role in Telford turning 50! Not only will you be kept informed of everything that’s going on but you can select when and where to volunteer and help make the golden events happen! We have different roles to suit different skills, so why not take a look and see which ones appeal to you! We provide support for you in your role and can also help you gain valuable new skills. Our GEMs will be easy to spot during the anniversary in their distinctive GEM T-shirts and we want them to wear these with pride, as this team will be key to Telford 50 success! Training packages, out-of-pocket expenses, standard references on request and much more - are the benefits GEMs will enjoy. Whom can I contact if I need more information?